In the two most recent analyses, we’ve explored the S-1s of Hubspot and Zendesk, two of the public SaaS companies with the smallest Average Revenue per Customer. 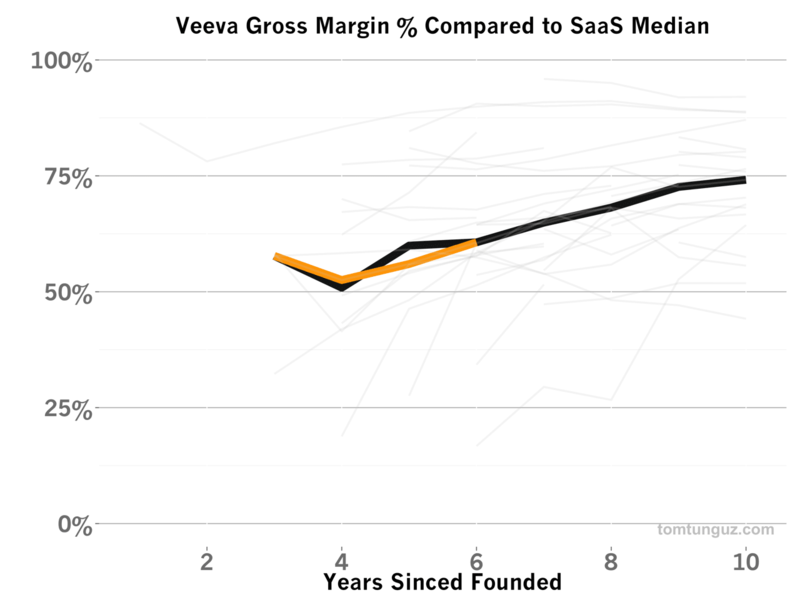 Today, we’ll look at Veeva, masters of the massive enterprise sale, and one of the most remarkable SaaS businesses. At the time of its IPO, Veeva employed about 600 people. Veeva offers a CRM tailor-made for the life-sciences/pharmaceutical industry and built atop Salesforce’s Force.com platform. In addition, the company provides its customers tools to manage clinical trials for healthcare treatment approvals. In the next seven charts, we’ll explore how Veeva built their business. We will explore revenue growth, average revenue per customer, sales efficiency, payback periods, net income, gross margin and engineering spending. In these plots, I’ve used Veeva’s colors as a consistent legend. 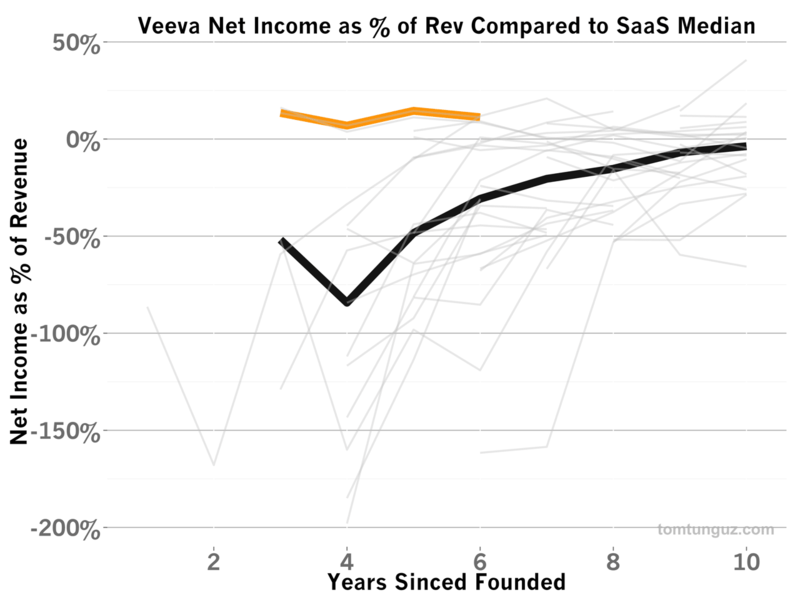 Veeva company data is orange, median values are black, and other company values from a basket of about 40 publicly traded SaaS companies are gray. Before diving into the benchmarks too deeply, I want to explain how different Veeva’s business is than most. No chart explains the distinction than the one above, Average Revenue per Customer. 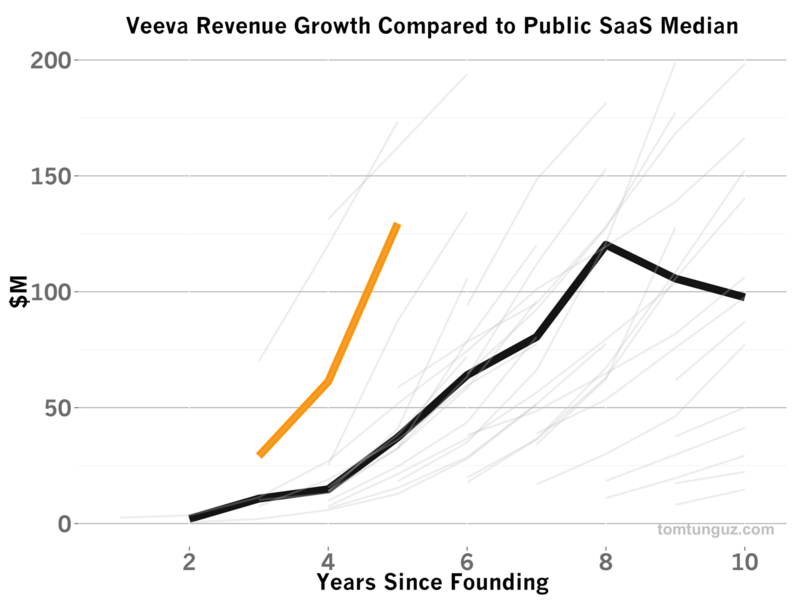 Veeva generates $780,000 per customer, 26x the median SaaS company (the blue dashed line). Only Workday comes close. Although Veeva focuses on a small universe of life-sciences companies (at IPO, the company served fewer than 200 customers), the unique value of their product enables them to command a huge amount for their software. In addition to the massive ARPC the company commands in the market, Veeva leverages the Force.com platform to reduce its time-to-market with its product. Veeva is essentially built on top of Salesforce and hence benefits from all the engineering effort Salesforce invests into its own product, reducing the total investment Veeva must make to satisfy its customers. The combination of high ARPC, unique product and speed to market enabled Veeva to become the third fastest growing SaaS company yet, reaching $61M in year 4 of its life, $130M in year 5 and $210M in year 6. For the four years of reported revenue, the company sustained a 93% CAGR, astounding figures. Only two companies, Salesforce and DealerTrak, have outpaced Veeva’s growth. Because of the concentration in Veeva’s customer base, the business doesn’t require a huge sales team. The net-impact of Veeva’s sales efficiency is a hugely favorable one. Veeva’s sales spend as percentage of revenue has averaged 18.5%, less than a third of the median of 56.5%. This customer concentration enables the sales team to focus on key, named accounts, which translates into a remarkable sales efficiency of 3.0. In other words, one dollar spent in sales and marketing translates into 3 dollars (!) next year for the business. This median figure is the best in the business. The other contender for the crown is Xero who recorded a 4.8 sales efficiency is year 6, but that business experiences a much greater degree of volatility in their sales efficiency and notched a four year median of 1.8, about 40% less than Veeva. It’s hard to know from the S-1, but I suspect a material fraction of the incremental gross profit must be derived from revenue growth within accounts, rather than addition of new customers. After all, winning a dollar from an existing customer is much more efficient than willing a dollar from a new customer. The sales efficiency hypotheses foots with the gross margin numbers, which are effectively identical to the median. 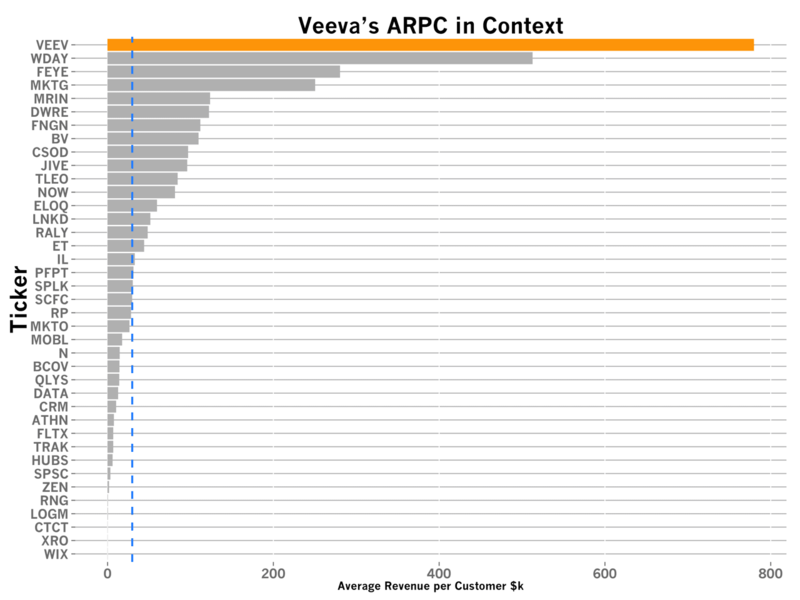 In other words, Veeva’s cost to support a customer, likely dominated by customer success but also inclusive of infrastructure costs, are on par with the rest of the field. 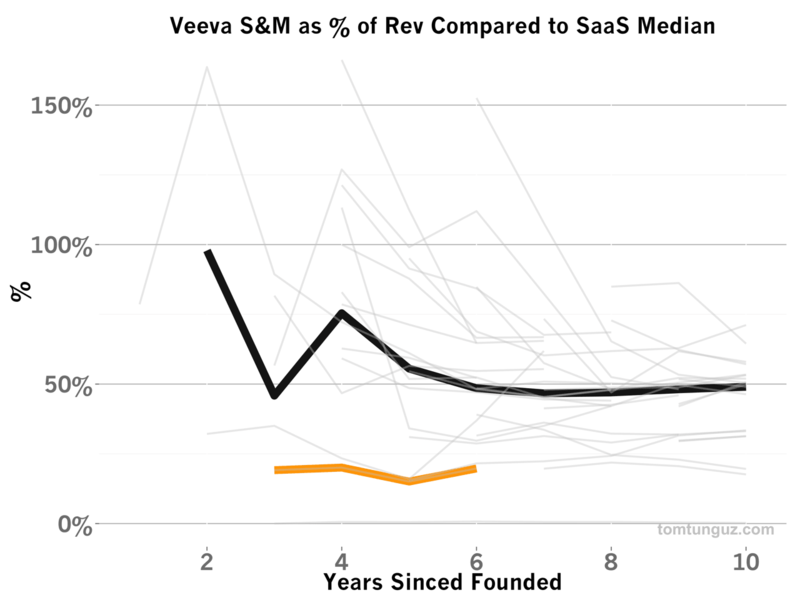 Veeva invests roughly the same proportion of revenue as other SaaS companies in maximizing customer happiness. And considering the revenue concentration in just a few hundred accounts, this money is well spent because churn of a few percentage points per year can reduce revenue materially. 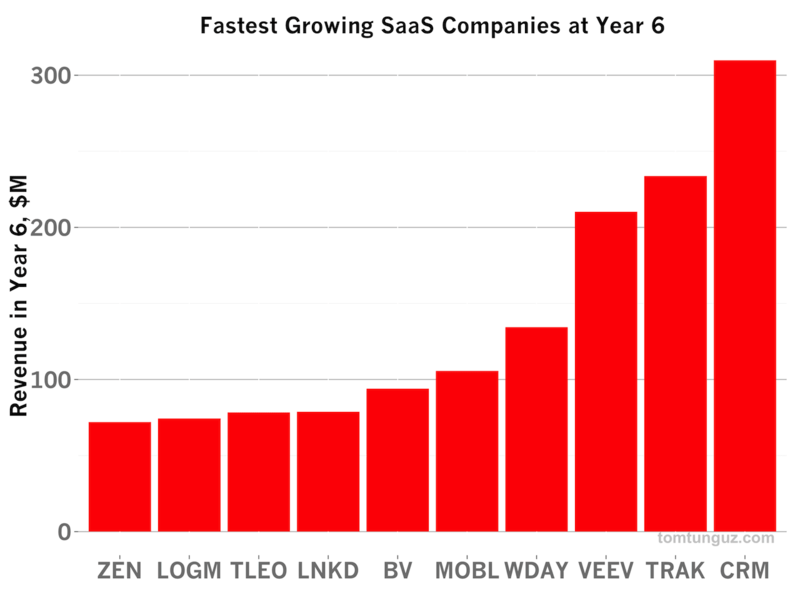 Veeva is the most profitable company in this basket of public SaaS companies. Over years 3-6 from founding, the business recorded a median profitability of 12.3% and was profitable in each of the four years. 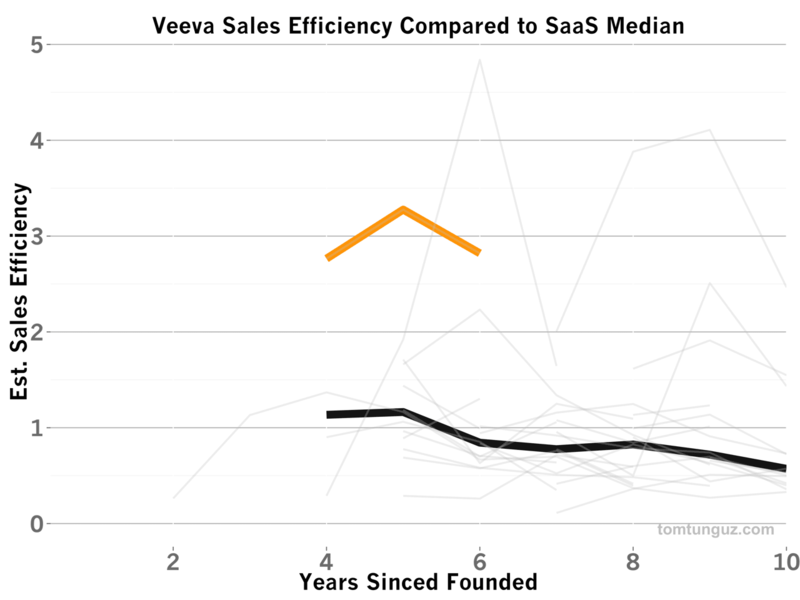 Only one other company, DealerTrak, another vertical SaaS company building software for car dealers recorded four years of profitability, although Veeva’s profitability median exceeded TRAK’s by about 26%. Salesforce and LogMeIn were the only two other companies to log profitable years in the same company epochs. Veeva’s capital efficiency is remarkable. The business raised only about $4.5M and then a few years later went public. The same story bears out in the Net Income chart, this time shown in gross dollars. Veeva continues to generate profits, not needing to reinvest all of their profit-dollars to create near 100% annual growth. 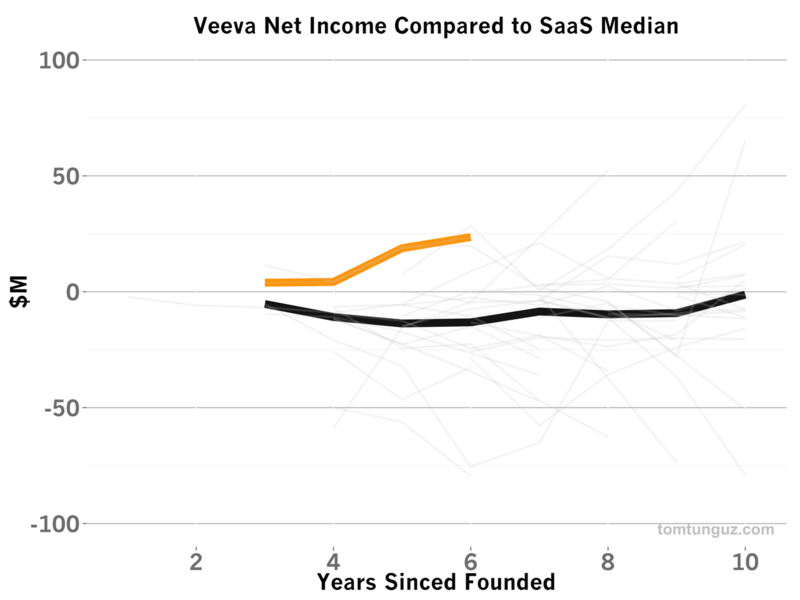 Again, because the company built its product on the Force.com platform in a multi-tenant fashion, Veeva incurs very little development costs compared to the median. 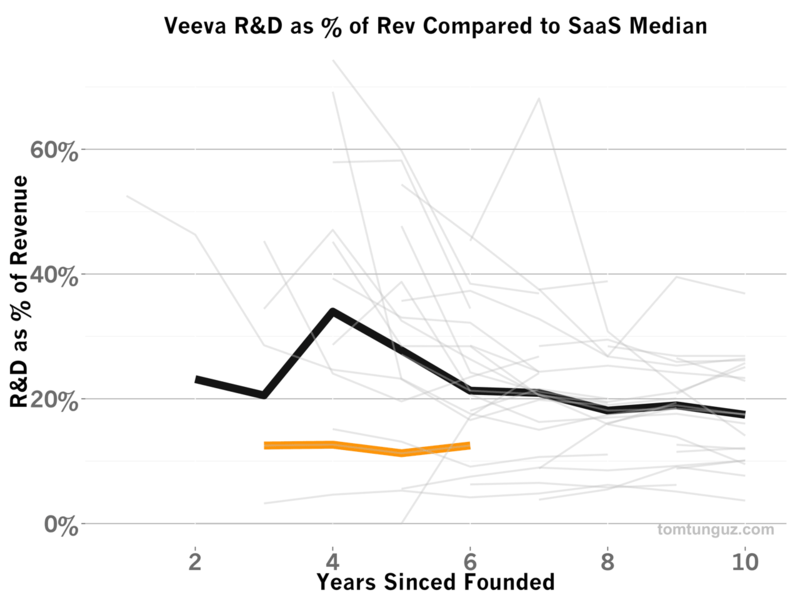 Veeva’s investment in R&D has averaged 12% over the past four years, 42% lower than the median during the same period. Again, only Salesforce and Dealertrack invested less in their product as a fraction of revenue than Veeva at year five. All in all, Veeva is a very special business. It’s the canonical example of a highly specialized SaaS business serving a small number of customers very well. This focus on one use case enables the company to command premium revenue per account and ultimately create one of the most efficient SaaS companies in history.